Cetona is a well-preserved mediaeval town located in the Val di Chiana in the extreme south-east of Tuscany, Italy, in the province of Sienna. It surrounds a hill where the rocca (fortress), containing a square tower (ca 900 AD) and an inner fortress wall, is located. This rocca became known as the Scitonia castle. In the 1300s, possession of Cetona frequently changed hands between Siena and Orvieto, and after a brief period under Perugia, it was annexed by Siena. An outer wall was built, containing two round towers (1458 AD) and Grand Duke Cosimo I de' Medici sold Cetona in 1556 to the Marquis Chiappino Vitelli, who converted the fortress into a private residence and built the piazza, today named Piazza Garibaldi. His descendants also erected Palazzo Vitelli in the late 1600s. The castle of Cetona is still privately owned. Cetona became a favorite of the trendy set in the Italy of the 1960s. This happened thanks partly to its geographical location halfway between Florence and Rome on the Autostrada del Sole but also because of the attractiveness of the town itself and the beauty of the surrounding countryside. Cetona remains popular - the clothing designer Valentino owns a palazzo here - and although it is off the tourist circuit the shops are good and it's a pleasant place to visit. Click here for vacation rentals in Cetona. 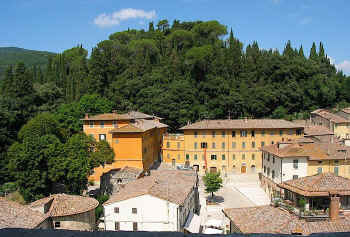 as are Scarperia in the Mugello, Loro Ciuffenna, Poppi, Pitigliano, San Casciano dei Bagni, Panicale, Montefioralle and Anghiari. 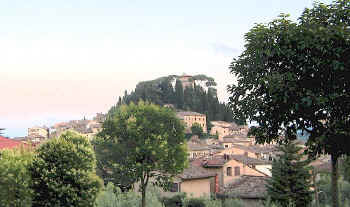 Viewed from a distance and from any direction, Cetona looks like a cone with houses climbing up its sides and with a large group of cypresses and pines hiding the castle at the apex. The Collegiate church, which dates from the 13 C and houses noteworthy paintings, including one attributed to Pinturicchio (1454-1513), is located just below the castle. Piazza Garibaldi is quite large for a town of 3,000 inhabitants and is the location of churches (S. Michele Arcangelo and SS. Annunziata) and residences (Palazzo Vitelli, l6 C) and, at the far end, the Rivellino tower which was part of the outer walls. The "historical centre" is uphill from the piazza, and includes the Palazzo di Giustizia, now the local police station, and further up, the Palazzo Minutelli, currently the town hall. Further on, the beautiful Collegiate church has its own little piazza. The path under the Arco del Brugi leads to the Costa dell'Arciprete, a curving, initially level path, that drops steeply steeply at Capperoni and continues towards Piazza Luca Contile (Piazza Paré) and to S. Michele church. Vorresti pubblicizzare la tua attività su questo sito web per Cetona e ricevere traffico in entrata dalla nostra rete di più di 50 portali relativi? Clicca qui per ulteriori dettagli in merito alla nostra soluzione integrata per una presenza su internet piena di successi. Cetona Italy © ammonet InfoTech 2008 - 2018 All rights reserved.